Brunei Darussalam – in Borneo Island with Malaysia and Indonesia (states). Brunei Darussalam is situated on the north-west of the island of Borneo, between east longitudes 114 degrees 04' and 114 degrees 23' and north latitudes of 4 degrees 00' and 5 degrees 05'. It has a total area of 5,765 sq.km. with a coastline of about 161 km along the South China Sea. It is bounded on the North by the South China Sea and on all the other sides by Malaysian State of Sarawak. Mid-year population estimates of Brunei Darussalam for 2017 was 421,300 persons compared to 417,256 persons in the Population and Housing Census Update 2016. This represented an average annual growth rate of 1.0 per cent during the period. Of the said total, 216, 400 (51.36%) are males and 204,900 (48.64%) are females. (http://www.depd.gov.bn/SitePages/Population.aspx, accessed on 8th September 2018). The 1959 Constitution established the Chief Minister as the highest official, with the British High Commissioner as adviser to the Government on all matters except those relating to the Muslim religion and Malay customs. Effectively, however, in all internal and financial matters, the country has been self-governing. Land administration was first handled by the British Resident which has the power to issue the letter of ownership to land applicants until the "Declaration of Constitution" in 1959 where this power was given to His Majesty Duli Yang Maha Mulia Paduka Seri Baginda Sultan and Yang Di-Pertuan Negara Brunei Darussalam through Sultan in Council. Brunei is an independent sovereign Sultanate which is governed on the basis of a written Constitution. Survey Department is the authority to produced Land Titles (but not registration), plans, maps and other matters regarding cadastral surveys, demarcation etc. Other government that are involved in Land Administration include Land Departments (registration, transfers), Town and Country Planning (planning, master plans etc). All the three Departments are under the Ministry of Development. Most cadastral surveys are undertaken by the government but Licence Land Surveyors (LLS) involvement in cadastral surveys are subdivision, revision surveys and TOL surveys. Qualification of a Licence Land Surveyors is required to pass an exam on cadastral surveys, planning issues and land administration set by Brunei Surveyors Board. Renewal of licence will be done annually and LLS need to ensure no pending payment to the Survey Department. By August 2018, 12 license land surveyors are registered in Brunei Darussalam. BIG (Brunei Institution of Geomatics) was established in 2003 and currently inviting Geomatics practitioners in Brunei to join. BIG membership compromised of Surveyors, Valuers and Planners. Brunei Licence Land Surveyors act is being used for licencing and registration of Cadastral surveyors. Surveying programs up to technician level is currently provided in Institute Brunei Technical Education. Whereas higher level mainly available overseas such as Universities in U.K., Canada, Australia and Malaysia. Brunei Cadastral system was designed for the purpose of registration, transfer of ownership, any land development, sub division and consolidation and others. Cadastral systems for the whole of Brunei is based on torren systems and use lot number as the identifier. Two departments are involved in cadastral i.e. Survey Departments providing the technical aspects, surveys, mapping etc and Lands Department providing the Registration, transfers etc. Survey Department provides cadastral mapping e.g. Land Titles, Plans, actual surveys e.g. fixing lots, subdivisions where all lot boundaries are fixed with cadastral surveys (demarcations). Since 1999 Strata Title Act was implemented and Brunei Survey Department is the Authority to carry out survey, to produce plans and Titles. The act was meant to monitor and control Strata Title Survey and to safeguard everyone involved. Total number of Cadastral lots in Brunei by August 2018 is just over 108, 232, these are mostly privately owned lots, Temporary Owner of Land and a number of lots occupied by government departments. The plots have been completely digital and supported by field notes and Survey Plans. Cadastral database was updated for every 3 hour on the Survey Geoportal through Fusion Manipulation Engine (FME) software. Most of the survey works done by the government are using 'Field To Finish System' and this includes the production of land title, Certified Plan, the digital survey sheet and updated the cadastral database. 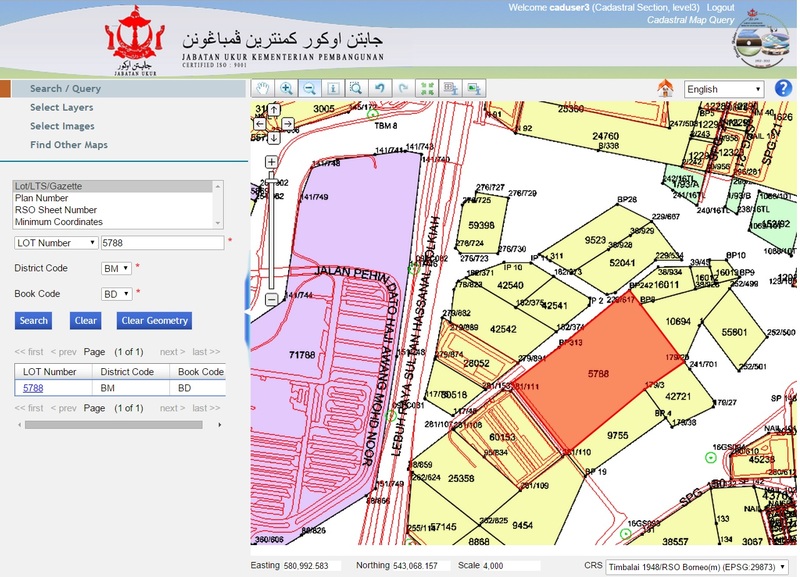 Survey Department is mainly using Oracle database and ArcSDE to store cadastral information. GIS software such as ArcGIS and ERDAS is used as a tools in map production and also to overlay the cadastral information on top of satellite imageries. Survey Department is currently preparing Cadastral Lots in a form of Sheets at 2,500 scale with information such as lot number (as the identifier) with other information such as district, village boundaries, locations etc. cadastral maps are also available at different scales when requested. Currently cadastral lots can be viewed freely in the Survey Geoportal. The Survey Geoportal is one of the government initiatives for survey spatial data infrastructure (SSDI) and as a platform to share data among government agencies, public sectors and private sectors. The basis of teh geoportal are the cadastral lots overlay with the satellite imagery. 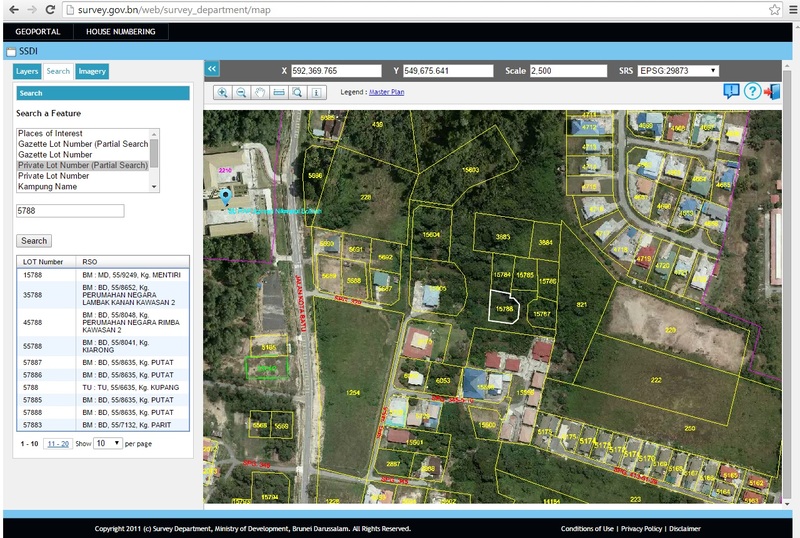 Currently Survey Department is on Geoportal of Survey Spatial Data Infrastructure (SSDI) whereby all the cadastral digital maps are available for viewing overlay with the images to departments and public. Sharing data for Goventment Agency, Public Sector & Private Sectors. Digital maps are available within the departments network although initiatives are being made so that this cadastral information is available in the net. Any application of digital data can be browsed through Geoportal for any development and planning purposes.